Back in 1975 I got into some nasty arguments with my company commander at Fort Riley, Kansas. He finally blew his stack and decided to punish me for my attitude. The punishment came in two parts: part one was post detail for a month and part two was schooling at the 5th Army NCO Academy on Main Post at Fort Riley. I had to pick five guys to help me on the detail and luckily five of my guys wanted a break from routine. So in February 1975 we reported to a temporary shelter near the ATSF memorial (a locomotive) on post for the detail. It turned out to be preparing a 280mm gun – “Atomic Annie” per its nickname – for display on post. This one had been part of a collection held by the Smithsonian Institution and had been in storage for over 15 years. So our new friend for the next month was T71 Gun 280mm on Carriage T72 number 20, built by the Dravo Corporation in 1952. It was actually fun other than we were in a very cold tent with only a Herman Nelson forced air heater for warmth and we had to use dope thinner to strip off the cosmoline and sealer used on the gun. Needless to say we were “floating around” from time to time inside the tent! We did get it done and prepared for installation, and once done the gun was moved to the top of a hill overlooking I-70. Alas, vandals and time have pretty much trashed the poor old gun, but it was a fun project. As for Part Two, I went to the NCO Academy in April and made honor graduate. The company commander was so mad he would not speak to me for six weeks - best six weeks I had under his command! Shortly afterwards I found the old Renwal 1/32 kit of the Atomic Cannon at the legendary Papenfus Hardware Store in Kansas City (MO) and bought it. Alas, it was pretty much a toy unless you wanted to put a LOT of work into the model and instead I gave it to one of the kids of my assistant NCO on the restoration project. The best model until now of this gun was the Adams kit in 1/40 scale which was far more accurate than the Renwal one, but still a “child” of the 1950s. 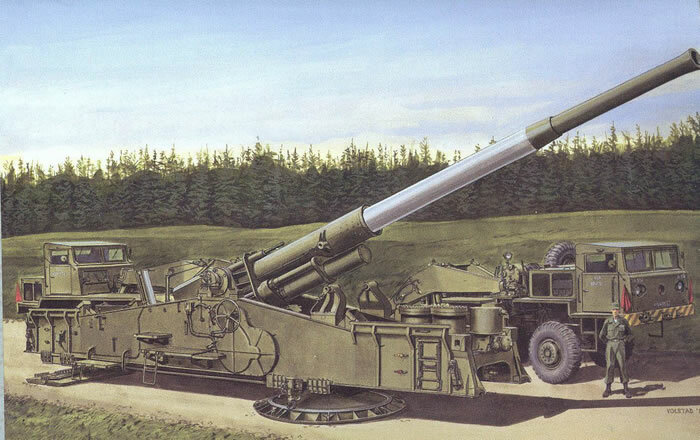 Now, at long last, DML has released a brand-new kit of the Atomic Cannon in 1/72 scale which is a good idea, as the entire gun in transport mode is nearly 85 feet in length so a much handier size! DML has captured the tractors, carriage, and basic components of the gun while also offering optional positions for transport and firing. The kit starts off with the tractors and as with the real T249 (front) and T250 (rear) tractors they share about 80% of their parts. The cabs come with an interior - one clever part (F33) provides all of the pedals at one go but there are no shift/transfer case levers provided. The drivelines are fairly complete for this scale and even mirrors are included. As a point of reference the first 17 steps cover the two tractors. The carriage is bulked up and does a good job of representing the sturdy carriage for this gun; however, all of the grill-type servicing platforms are molded onto the other sides (A24/A25) which is a shame, as they are all deployed when the gun is being fired (and which we had to reinstall and repair so they worked when working on our gun). Part A8 is NOT oversized either - the wheel was that big! The gun is quite large and takes six parts from muzzle to breech - the front section is slide molded but has none of the very prominent rifling present in the tip. Note that it slides into the upper carriage - unless you want to show it in firing position I suggest as do the directions you leave it loose. The gun is free to elevate and the hydraulic cylinders will function with careful assembly (F18/18/19/19/20/20/21/21). However, it cannot be traversed on its baseplate (C4) and traversing shoe (B27). The kit does get one thing wrong - the travel position of the gun. Our gun Number 20 had the barrel in travel position when we got it: the breech is disconnected from the recoil mechanism and pulled back by a winch on one of the tractors until it will fit inside the rear lifting cradle. DML shows it in position and slightly elevated, which apparently was okay for very short distance movements. As the barrel is left loose, the barrel may be moved to the rear and correctly positioned. Note that anyone wanting to fix it that way will need to put four short rods (about 30 inches in scale) on the rear of the upper cradle to represent the recoil and balancing cylinder rods which are disconnected from the breech when this takes place, remove the locking nuts from the rear of the breech and drill out the holes for the rods. The model comes with three finishing options: Gun A-20, 59th Field Artillery Battalion, 7th US Army, Germany 1954 (OD with bumper stripes and white codes; A-31A, 216th Field Artillery Battalion, Germany 1955 (OD with bumper stripes and white codes and stars); and Aberdeen Proving Ground, Maryland 1950s (OD with bumper stripes and white data). A small sheet of Cartograf decals is included. Overall this is a great kit with the only clinker being the fixed servicing platforms (they would have better done in etched brass over plastic frames).